Spacious 46 sq.m. studio for sale & rent at “Laguna Heights”. 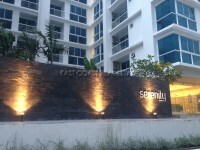 This unit is located on 4th floor, and comes fully furnished. Quality built-in European kitchen with hob & hood, oven and refrigerator. Good sized living space, king sized bed, flat screen TV, sofa, fitted closet, air-conditioning throughout, and modern bathroom with hot water shower. Big balcony with green views and some ocean views. Facilities in this complex; Night time security guards, key card access, lobby area, fitness center, communal swimming pool, maid service, parking space with remote gated control. Available for SALE under company ownership, and for RENT with a minimum of a 12 month contract.